Forget the superstition, forget the comparison to the Rockets 22 game streak of ’08, forget that it was broken five years ago today. The Miami Heat have won, again. The comparisons are only incidental, this Miami Heat team is completely different than that Rockets team of 2008 that lost to the Boston Celtics. Some sports pundits went so far as to guarantee the Celtics would get this win… Lebron and company disagreed. Probably the most unexpected part of this game was Jeff Green scoring 43 points. This Heat win never really seemed unlikely to me, something about the chemistry of this team and the play of Lebron reassured me they would continue to win. Shane Battier played fantastic defense down the stretch, stripping Jeff Green on a drive to the bucket to leave 7 seconds on the clock. Lebron gets credit for the winning bucket, hitting a two-pointer down the stretch to put the Heat up 105-103. They trailed 96-83 with 8 minutes left, but somehow kept up their trend of amazing 4th quarter play to pull out the victory. 23 straight victories is impressive, the second longest streak in NBA history. Only the Wilt Chamberlain and Jerry West Lakers have more consecutive wins (35). 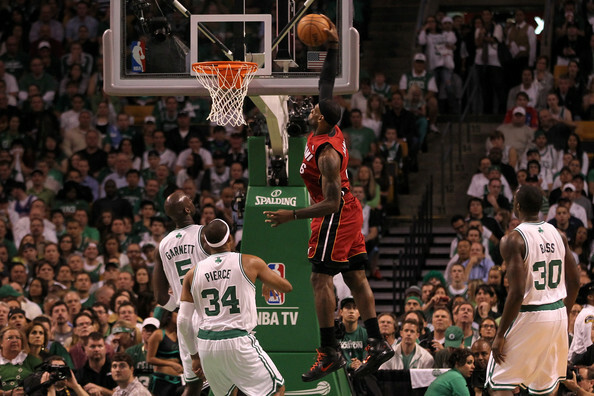 As an added treat, check out Lebron dunking over Jason Terry tonight, pretty filthy.